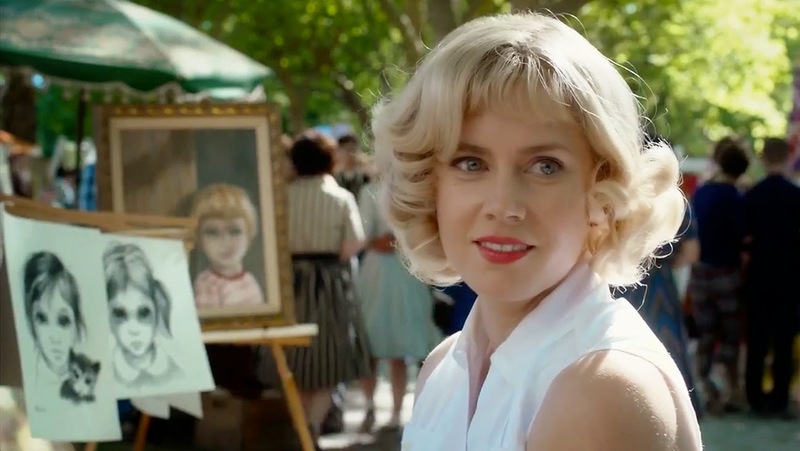 A biography of artist Margaret Keane during her time with conniving husband Walter, Big Eyes is an amiable drama with elements of comedy. The film is engaging, but also limited by the ultimately small scope of the story. It's the 1950s, and Margaret Ulbrich (Amy Adams) finds herself a divorced mother of young daughter Jane. She moves to San Francisco and pursues her hobby of painting sad children with big eyes, a singular motif in dozens of poses. Margaret meets fellow struggling artist Walter Keane (Christoph Waltz), who claims to be trained in Paris. They fall in love and quickly get married. Walter has a slick hustler's attitude and an ability to sell anything. He starts to peddle Margaret's paintings, and once they start to generate interest, he claims them as his own. He convinces Margaret to go along with the ruse, on the basis that women artists are not taken seriously, and she agrees, signing the paintings simply Keane. The images of melancholy big eyed children become a cultural sensation, and Walter mass-markets the art through television appearances, prints, posters and postcards. The Keanes become extremely wealthy, but with Walter becoming more erratic and the love evaporating, the marriage heads towards trouble. Director Tim Burton takes a break from his typical dark and brooding aesthetics, and dabbles in something altogether more routinely domestic. Big Eyes is a relatively straightforward but also true story of a snake oil salesman taking advantage of a vulnerable woman to peddle schlocky pop art. Everybody gets rich and for a while, a bit happy, until the fad passes and greed consumes the money machine. Big Eyes has a bright and cheery look, celebrating 1950s faux chic with vivid colours and a sense of West Coast street optimism. The film never wallows for too long at any point in Margaret's journey from divorcée to maligned artist seeking redress, Burton keeping the pacing brisk and the focus firmly on the central couple's evolving relationship. Throughout its second act, the film portrays Margaret as a victim suffering in silence and reluctantly going along for the ride, although never comfortable with Walter's misrepresentations, especially when it comes to lying to her daughter. But her years of acquiescence, squeamish as it may have been, cannot help but seep away sympathy from her corner. Combined with the redundant hokum of her artwork, Margaret is a difficult character to fully cheer for. This takes nothing away from Amy Adams' committed performance. In a reserved but ultimately steely display, Adams conveys Margaret as full of quiet self-doubt, uncertainty and mounting suspicion that the man she hurriedly married is both less and more than what he initially appeared to be. Christoph Waltz gradually but steadily goes over the top, starting out with Walter as a smooth persuader and ending the film as a joke of a man, desperate to hang on to his castles in the air, his big eyes for unearned wealth having created an empire built on the fault line of mass deception.